LIST OF COUNTY OFFICERS FROM YEAR OF ORGANIZATION:--SHERIFFS—PROTHONOTARIES—TEGISTERS AND RECORDERS—COUNTY TREASURERS—COUNTY SURVEYORS—COUNTY COMMISSIONERS—MEMBERS OF CONGRESS FROM TIOGA COUNTY—STATE SENATORS FROM TIOGA COUNTY—REPRESENTATIVES IN THE LEGISLATURE—COUNTY SUPERINTENDENTS—COUNTY OFFICERS AT THE PRESENT TIME—AGRICULTURAL STATISTICS—THE BLOSSBURG COAL—POPULATION OF TIOGA COUNTY BY TOWNSHIPS AND BOROUGHS—CONTRIBUTION OF TIOGA COUNTY TO THE WAR FUND—THE TIOGA COUNTY MEDICAL SOCIETY—THE PUBLIC HEALTH FOR THE YEAR ENDING JUNE 1, 1876—THE FIRE DEPARTMENTS OF TIOGA COUNTY—NEWSPAPERS PUBLISHED IN TIOGA COUNTY AT THE PRESENT TIME—NAMES AND ADDRESSES OF ATTORNEYS NOW PRACTISING AT THE BAR OF TIOGA COUNTY—REPORT OF THE COUNTY SUPERINTENDENT FOR THE YEAR ENDING JUNE 1, 1876—SCHOOL STATISTICS OF TIOGA COUNTY: STATEMENT FOR SCHOOL YEAR ENDING JUNE 1, 1876—SUNDAY SCHOOL ASSOCIATIONS OF TIOGA COUNTY. 1808-9-10, Samuel W. Morris; 1811, Alpheus Cheney; 1814, B. Thompson; 1815, Benjamin W. Morris; 1817-18-19, Daniel Lamb; 1820-21, Robert Tubbs; 1822, John Beecher; 1823-24, Thomas Putnam; 1825-26, William Willard, Jr.; 1827-28, Levi Vail:1829-30, Elihu Hill; 1831-32-33, Thomas Dyer; 1834-35, John Barnes; 1836-37, Archibald Knox; 1838-39-40-41, Thomas Dyer; 1842-43, R. G. White; 1844-45, Jno L. Robinson; 1846-47, A. H. Bacon; 1848-49, Geo. Levergood; 1850-51, S.L. Hibbard; 1852-53, George Knox;1854-55; Henry Rathbone; 1856-57, O.H. Blanchard; 1858-59. O. F. Taylor; 1860-61, James S. Watrous; 1862-63’ H. B. Card; 1864-65, A. M. Spencer; 1866-67, C. F. Miller; 1868-69, H. C. Bailey; 1870-71-72, Robert C. Cox; 1873-74, Henry Rowland; 1875, Thomas Allen, present incumbent. 1809-10, Eddy Howland, Uriah Spencer, Caleb Boyer, Nathan Niles, and George Hart; 1811, Eddy Howland; 1812, Timothy Ives; 1813 Ambrose Millard; 1814, Hopestill Beecher; 1815, Justice Dartt; 1816, Robert B. Elliott; 1817, John Knox; 1818, Asa Mann; 1819, Elijah Depui; 1820, John Ryon, Jr.; 1821, Oliver Willard; 1822, Seth Daggett; 1823, Hiram Beebe; 1824, William Knox; 1825, Elijah Welch; 1826, Elijah Stiles, 1827, James Goodrich; 1828, L. Jackson; 1829, John Cochran; 1830, E. B. Gerould; 1831, Job Geer; 1832, A. Hammond; 1833, C. Alvord; 1834, George Knox; 1835, Samuel Miller; 1836, C. N. Sykes; 1837, P. Doud; 1838, George Levergood; 1839, Buel Baldwin; 1840, Levi Elliott; 1841, C.O. Spencer; 1842, M. W. Stull; 1843, H. H. Potter; 1844, E. Howland; 1845, William Rose, Jr.; 1846, John fox; 1857, Israel Merrick; 1848, David Ellis; 1849, Leander Culver; 1850, David Caldwell; 1851, Ansel Purple; 1852, Benjamin Van Dusen; 1853. Austin Lathrop; 1854, O.B. Wells; 1855, D.G. Stevens; 1856, C. F. Culver; 1857, John James; 1858, L.D. Seeley; 1859, Amos Bixby; 1860, A. Barker; 1861, Job Rexford; 1862, C.F. Miller (appointed to fill vacancy caused by decease of Amos Bixby); 1863, C. F. Miller, Myron Rockwell; 1864, E. S. Seeley, 1865, E. Hart; 1866, P.V. Van Ness; 1867, Job Rexford; 1870, Job Rexford; 1871, R. O. Hollis; 1872, E. Hart; 1873, L.B. Sheives; 1874, E. Klock; 1875, L. L. Smith, E. J. Purple, N.A. Elliott. At this time Tioga and Bradford counties formed a representative district. In 1835 two members from Bradford County, Israel Myers and Dr. Bullock, were elected for the district. Tioga and Potter counties formed a representative district in 1838, and Lewis B. Cole was elected. John Wahlee was elected in 1841, and served one year. The act of the legislature creating this office was passed in 1854. Since that date the duties of the position have been performed at different times by Rev. J.F. Calkins, Wellsboro; Rev. N.L. Reynolds, Wellsboro; H.C. Johns, S.B. Price, Academy Corners; Prof. E. Horton, Jr., Knoxville, and Miss Sarah I. Lewis of Westfield, the present incumbent. Miss Lewis is the only lady holding his laborious and responsible office in the State. Having been for a long time intimately connected with the educational interests of the county, she is peculiarly well qualified to assume the duties of the position. She graduated from the Mansfield state Normal School in 1868, and has since been successfully employed as a teacher in some of the best schools in the county; and she bring to aid her in her work not only a fine education and a practical knowledge of the daily life and labors of the teacher, but a ready tact and energy which have combined to render the progress of the school interests of Tioga County, during her term of official service thus far, highly satisfactory. Sheriff, D. H. Walker; Prothonotary, R.C. Cox; Register and Recorder, George C. Bowen; Treasurer, Thomas Allen; Surveyor, David Heise; Commissioners, L.L. Smith, N.A. Elliott and E.J. Purple; Auditor, C.M. Moore; Representatives, Hugh Young and C.V. Elliott; State Senator, C. H. Seymour; Member of Congress, John I. Mitchell, Superintendent of Public Schools, Miss Sarah I. Lewis, Jury Commissioner, G. H. Baxter; District Attorney, Horace A. Packer. As will be observed, this table is incomplete; but it will serve to give the reader an idea of the resources of the county. A more perfect exhibit cannot be obtained at the present time. The section was remarkably free from epidemics during the entire year. A mild type of sickness prevailed during much of the time. Fevers were not very prevalent. Isolated cases of remittent, typhoid and intermittent fevers occurred, yielding readily to treatment. Throat and lung diseases of a mild character prevailed quite extensively during the winter and spring months. There were but few cases of pneumonia. The climate of this section conduces to the development and continuance of catarrhal affections; and but few are entirely free from diseases of this character. Bronchial affections were prevalent and obstinate. Eruptive diseases prevailed quite extensively. Measles of a severe type was quite prevalent early in the spring. There were numerous cases of mumps in some parts of the county. There were but few cases of scarlet fever and diphtheria, and they were mostly of a mild type, the latter especially being of short duration. Wellsboro, Tioga and Blossburg have well organized and efficient fire departments. The citizens of other towns, among them Lawrenceville and Mansfield, are making strenuous exertions to secure a like protection for their own property. It is to be hoped measures of such vital importance will not be too long delayed. Few counties have suffered more from fire than Tioga. Advertiser—Mansfield, Pratt & Goodenough, Independent. One of the spiciest local papers in this section. The editor is O.D. (widely known as "Ben") Goodenough. It circulates extensively through the eastern and central townships of the county. It has recently been enlarged to seven columns. AGITATOR—Wellsboro, Barnes & Roy, Republican. This is one of the most widely read and influential papers in the Northern Tier. A.F. Barnes, the editor, is an able and forcible writer. For years it has been unswervingly devoted to the principles of the Republican party. EXPRESS—Tioga, A.H. Bunnell, Independent. An independent family journal, in the best sense of the term, having a large circulation in Tioga County and other sections of Northern Pennsylvania. Its proprietor, A.H. Bunnell, is a pungent writer, and a discriminating editor. GAZETTE—Wellsboro, F. G. Churchill, Democratic. The only Democratic newspaper and the acknowledged organ of the party in Tioga County. It is ably conducted and has been much improved under the management of its present proprietor. It is read extensively throughout the county and elsewhere. THE IDEA—Westfield, O.S. Webster, Independent. A lively weekly paper, devoted to the interests of the towns of the Cowanesque Valley and Western Tioga County. It is edited with ability and pledged to all necessary reform and the welfare and progress of the people at large. THE JOURNAL—Elkland, E. M. Bixby, Independent. The Journal is a neatly printed and attractive appearing paper, of fair size. It has a good circulation in the northern and western townships of the county, and is filled with local and general news and well-selected miscellany. THE REGISTER—Blossburg, I. R. Doud, Independent. A large and well conducted family newspaper, receiving a good support from the southern and eastern portions of the county. Under the control of Mr. Doud, it has been improved and its circulation greatly extended. It is probable that there is no county in this part of the State where the press is more able and skillfully conducted or more liberally sustained. Most of the newspaper men of Tioga county are gentlemen of practical experience, who know how to interpret the wants of their patrons, and are zealous in supplying them. The most important events in the history of the press of Tioga county will be found in our chronological department. The ELMIRA ADVERTISER, Daily and Weekly, the ELMIRA GAZETTE, Daily and Weekly, and the CORNING JOURNAL, the CORNING DEMOCRAT, and the CORNING INDEPENDENT, also circulate extensively in Tioga County, and the county journals are liberally patronized by the advertisers of Elmira and Corning. BLOSSBURG, John C. Horton, C. Rathbone; ELKLAND, C.W. Beach, J.S. Ryon; KNOXVILLE, Lewis Mead, C.L. Peck; MILLERTON, S.E. Kirkendall; TIOGA, John W. Guernsey, F.G Bishop, L.H. Tuttle, F.E. Smith, C.H. Seymour; WELLSBORO, J. H. Bosard, Thomas Allen, M.F. Elliott, A.L. Ensworth, H.M. Foote, Jeff. Harrison, George W. Merrick, John I. Mitchell, John N. Bache, Jerome B. Niles, H.B. Packer, Henry Sherwood, Walter Sherwood, L.P. Willistin, J. W. Mather, David Cameron, S.F. Wilson, F. E.Watrous, E.B. Young; MANSFIELD, John W. Adams, Henry Allen, F.W. Clark; WESTFIELD, B.B. Strand, T.C. Sanders, J.C. Strang, Augustus Streeter; COVINGTON, A. Redfield. In this, her first report, Miss Lewis announces that she is able to give a favorable account of the general interest manifested by the people in the cause of education. She has been received with uniform kindness in all parts of the county, and has enjoyed the earnest and cordial support of citizens, and the hearty co-operation of teachers. She has traveled more than 2,500 miles, held about forty examinations, one county institute, been present at several local institutes , written over two hundred official letters, and made about two hundred and ninety visits. The large extent of territory, irregularity of opening and closing schools, and similar obstacles, have prevented her reaching all the schools in the county. She reports much improvement in the grounds and general surroundings of school-buildings, and notes the fact that the people are beginning to believe that the best schools are held in good houses. This augurs well for further improvement. There are many good teachers; but a lamentable lack in apparatus and a great diversity in text-books, prevents their doing themselves justice in many instances. Her predecessor in office, Prof. E. Horton, did much to awaken a healthy interest in county institutes, and is entitled to credit for having established them and made them popular. The best teachers attend them, and they may be regarded as highly successful. Much interest has been induced by local institutes. She urges parents to visit schools more frequently, and work with the teachers for the advancement of the scholars. The frequent change of teachers she regards as a great hindrance to the rapid advancement of pupils; and is pleased to note that a few townships and nearly all the boroughs have discountenanced the system of "boarding around," and now give their teachers a home. Miss Lewis promises much improvement in the educational interests of the county during the coming year, and invites the co-operation of the people, that she may be able to make her promise good. There are two societies for the advancement of the Sunday-school cause in the county—the Tioga County Baptist Sunday-school Association, and the Tioga county Sunday-school Teachers Association. The first was organized in 1868, and is exclusively an auxiliary of the church from which it receives its name. It is gaining in numbers and influence every year, and its sessions are well attended. The membership of the latter is much more numerous, embracing, as it does, the most earnest and enterprising Sunday-school workers of all denominations. 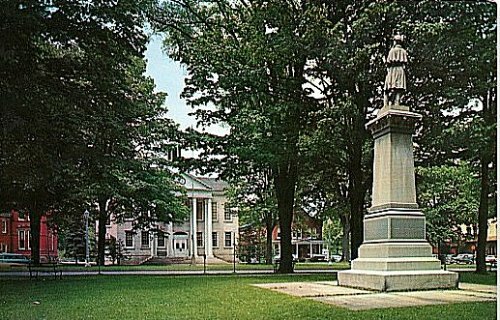 It is of much later origin—its fourth annual meeting having taken place at Lawrenceville early in June, 1876. a subsequent session was held in Elkland in the fall. At these meetings, essays on the Bible, Sunday-school organization and management, and kindred topics, are read and discussed; experiences of teachers are stated and compared; plans for inculcating gospel truths upon the youthful mind are suggested and considered, and no measures are neglected that promise to afford any aid to Sunday-school work and extension. The influence of these organizations towards systematizing the labor of teachers, and rendering it effective, is scarcely to be estimated; and those who have been instrumental in advancing them to their present flattering prominence, regard with satisfaction the obvious promise that they will be still more useful in the future than they have been in the past.